Make your yard the talk of the town by investing in one of the many deck designs and decking options available from Chesley Fence & Deck. Here at Chesley Fence & Deck, we are able to create the deck of your dreams. We will custom design your deck in your Carlyle, Illinois yard to meet your style preferences and lifestyle needs. And, once it is designed to your liking, we will build it with skill and precision to your exact specifications to ensure years of enjoyment. At Chesley Fence & Deck, we offer more than just custom deck designs. 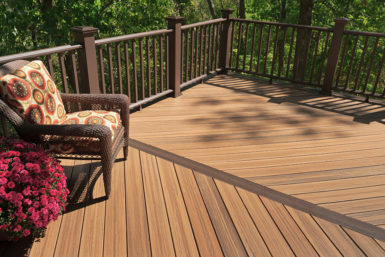 We also offer a number of different decking options to suit any homeowner in the Carlyle, IL area. This is our most affordable decking option, and it can be stained and sealed for years of beauty and performance. Our premium cedar decking has a natural, rustic look and is easier to maintain than many other wood decking options. Like treated lumber, it can also be stained and sealed. This synthetic decking option is plastic throughout the product and is extraordinarily low maintenance, allowing you to spend more time enjoying your deck rather than cleaning it. This is our premier decking option, as it has the look of real wood, but will not fade, splinter, or stain. It is also easy to maintain, very durable, and backed by a 20-year warranty covering staining, fading, and deterioration. Contact Chesley Fence & Deck today to learn more about our custom deck deigns and decking options. We are proud to serve residents of Carlyle, IL, as well as all of Clinton County, including Beckemeyer and Germantown.